After installing zabbixGrapher or implementing Zabbix graphs improvements patch you might face with an issue of slow image loading on graphs page which contains 24 pics at once. 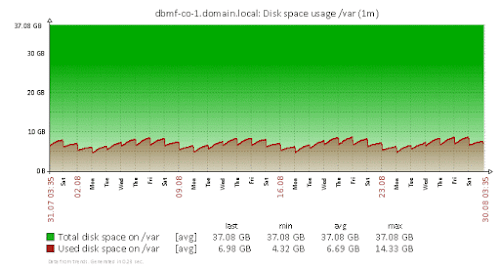 And this problem could get worse depending on how much online users you have in Zabbix. In our case solution was to cache images for 1 minute, as we have usual Item interval=60sec. 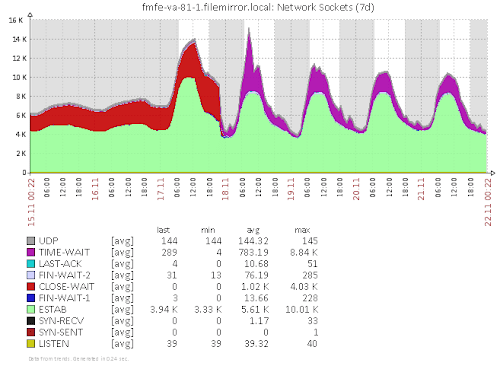 This will help when multiple users looking at the Graphs for same Host (happens when it appears in Monitoring). Also, by default Users in Zabbix have setting to update graphs each 30sec, so caching for 60sec would reduce load twice. Nginx cache is fast key-value store, so we need to decide on string Key based on URL to uniquely identify each image. First issue is that same parameters in URL could be at any place, thus making different string Keys pointing to the same image. So, we need to always store parameters in the same order in the Key. Another thing is that we do not need all the parameters. For example for different users 'sid' would have different values, but we want to show same image from cache to all the users. 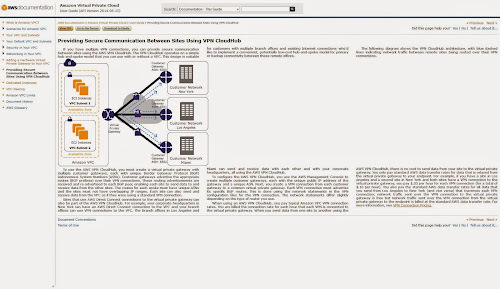 Main thing is in location 'chart2?\.php' which is regex corresponding to both chart2.php and chart.php. We strip $request_uri to parts we care of, and setting variables to values of those parts. Then we collect all variables in predefined order, to make consistent Key for same image, this will be stored in $xkey variable. There is no need to cache graphs for more than 2min, as each image has 'start time' and 'period'. Thus having Key updated each minute, we do not need to store old outdated pics for longer time. Check zabbixGrapher again by moving through pages back and forth, or selecting and deselecting the same Host - and images should appear immediately. It is a short note on getting monitoring data for Elastic Load Balancer to your Zabbix installation. Read more details on each item in the docs. One thing to note, that each counter could be accessed as Average, Min, Max, Sum and Count. So, for RequestCount Min and Max would be always 1 but Sum would be equal to Count and mean number or request per interval (1min or 5min). In other case Sum would not have meaning for HealthyHostCount but you would be more interested in Average. That complicate things a little comparing to Zabbix. But there is one more thing (c) - CloudWatch do store items only when events happens. 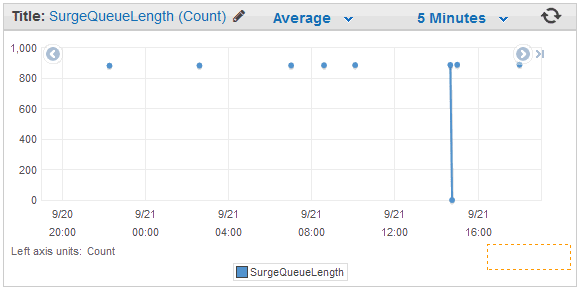 So, if you have small requests numbers on some ELB you could face with SurgeQueueLength stuck at 1k or something. Which is not meaningful, because it happened once, an hour ago, and there just were no much requests from that time. 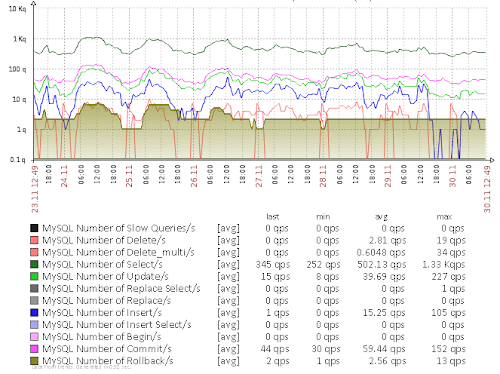 Passing this data to Zabbix directly you would end up with line at 900 connecting all the dots. Which is not true, line should be at 0 with intermittent spikes to 900. Ok, at least we know how to get current data, and we will just return 0 to zabbix when there is no value collected by CloudWatch with current timestamp. I used python and boto and get results pretty easy. Also, there are multiple cloudwatch-to-zabbix scripts around. But they all works as zabbix agent checks (passive or active). So, for example to get those 10 counters for one ELB each minute, zabbix would fire the script 10 times/min, and each time script would connect to AWS to get the data. But API query to get the data is the same, even more - you can get up to 1440 points by one query. 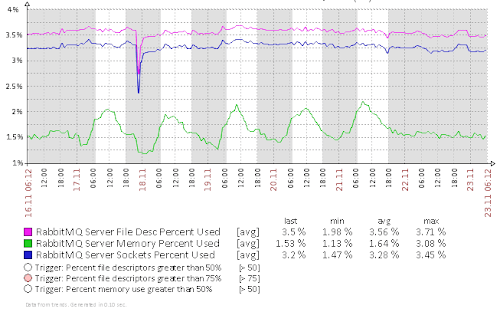 That's why it's better to make this monitoring to use zabbix traps. 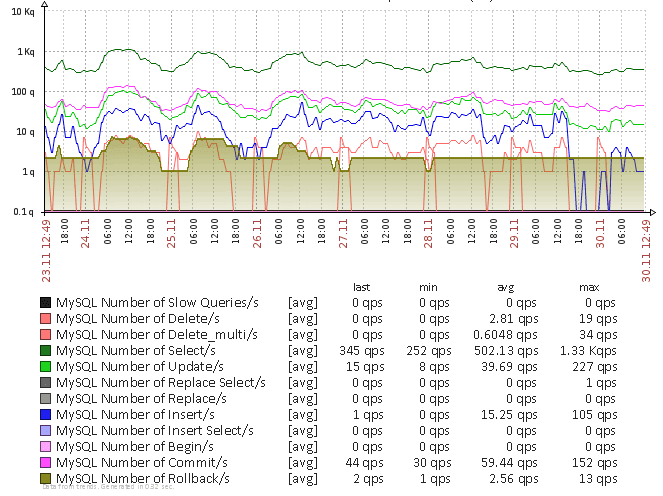 This way zabbix would do only one query to agent per minute, and it would get all 10 counters in one call. Usually ELB stats are not host bound, so this script should be not 'zabbix agent extension', but 'external check' on server/proxy. To use it, you would create dummy server in zabbix (with pretty name like "ELB"), and attach template to it. 2. Fix script with your AWS key. If you do not have API key yet - you could read on how to generate it here. Due to it is stored in script in clear text you might wish to at least limit script access by chmod/chown. Better way would be if you have zabbix proxy EC2 VM - just grant necessary API rights to it directly without using key at all. Check that zabbix_sender is installed, and config has valid zabbix-server specified. Trap data would be send there. 4. Open zabbix web interface and create dummy server named, say "ELB". Set corresponding zabbix-proxy for it, which has our script in externalscripts folder. and assign it to created dummy server. Go to discovery and fix refresh time for the only active check prototype (everything else are traps) to 1min or 5 min depending on if you use detailed CloudWatch checks or not. (Template has 1min set as we are using detailed checks). Also, check filter tab for discovery, as we are filtering ELBs having 'test' in their name. 6. Discovery should create items for all found ELBs. This will skip all ELBs which name contains 'test'. Configure to your needs or just delete Filter. CloudWatch stores all the collected items for 2 weeks timeframe. Each item has corresponding timestamp. So, it is possible to get all the archive data and put it to zabbix, as zabbix_sender also support providing timestamps along with values. Only issue is as described above, when there were lack of events and items would be unmeaningful, without any drops to zero. info from server: "processed: 250; failed: 0; total: 250; seconds spent: 0.001387"
info from server: "processed: 250; failed: 0; total: 250; seconds spent: 0.001380"
info from server: "processed: 250; failed: 0; total: 250; seconds spent: 0.001391"
info from server: "processed: 250; failed: 0; total: 250; seconds spent: 0.001383"
info from server: "processed: 250; failed: 0; total: 250; seconds spent: 0.001403"
info from server: "processed: 250; failed: 0; total: 250; seconds spent: 0.001389"
info from server: "processed: 189; failed: 0; total: 189; seconds spent: 0.001050"
This process could take up to 5min to run, and should end up with no errors. 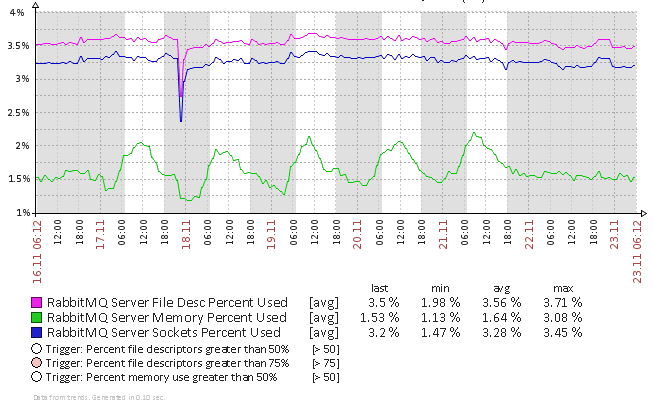 Wait 5min more and take a look at zabbix graph history for this ELB - you should see data for 2 weeks ago from now. info from server: "processed: 10; failed: 0; total: 10; seconds spent: 0.000095"
This adds groups filter. Issue is when you have a lot of groups you'd become tired to scroll them. (We have hosts automatically registering to Zabbix and attached to group). For example in this case groups "EXRMF BC", "EXRMF CO", "EXRMF DC3" etc. are merged to one group "EXRMF >". When you select such group another select appears on the right side allowing to specify exact group. This implements both ZBXNEXT-1120 and ZBXNEXT-75. 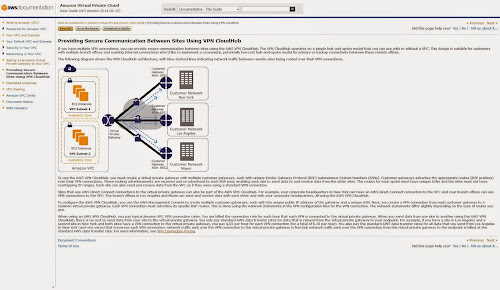 So, now you can select host and do not specify graph to view all its graphs on one page. 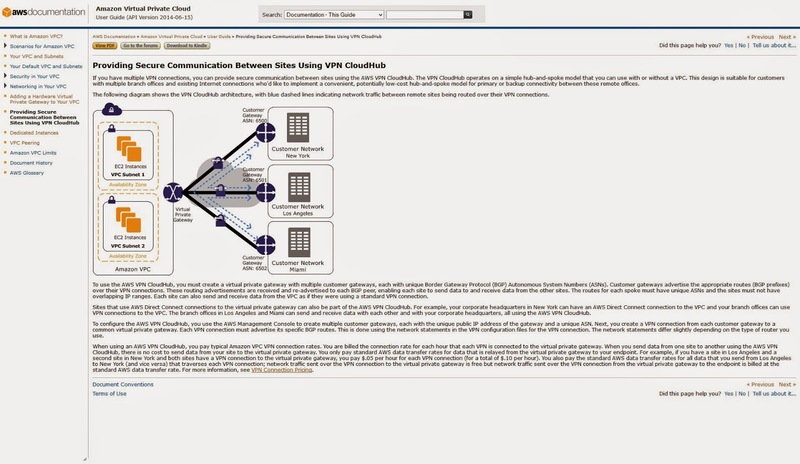 Or select graph to view and do not specify host (or even a group) to view this graph for multiple hosts. This change is for search field. You start typing servers and got list of suggestions. Pressing Enter previously just selects server from list filling in search field. You have to press Search button to do action. Now action is done automatically. then maybe you would be interested in this post. I've tried all of those apps, and used some of them for couple years. Mostly it is for code snippets, but sometime for note taking too. That's why I wanted code syntax highlighting and ability to quickly hide and show app by hotkey. Unfortunately I was not able to find app solving both items. That's how SynTree was born back in 2006. As time goes by, new idea of syncing everything to cloud come and simplenote.com API released for developers. I'd like the idea and thought to add it's support to SynTree, but it was written in Delphi 6 and stored all data in memory. As my notes counted megabytes already, I was too lazy to search for old Delphi IDE as already have free Visual Studio installed, so decided to rewrite everything from scratch in C# and use sqlite to not limit notes size. 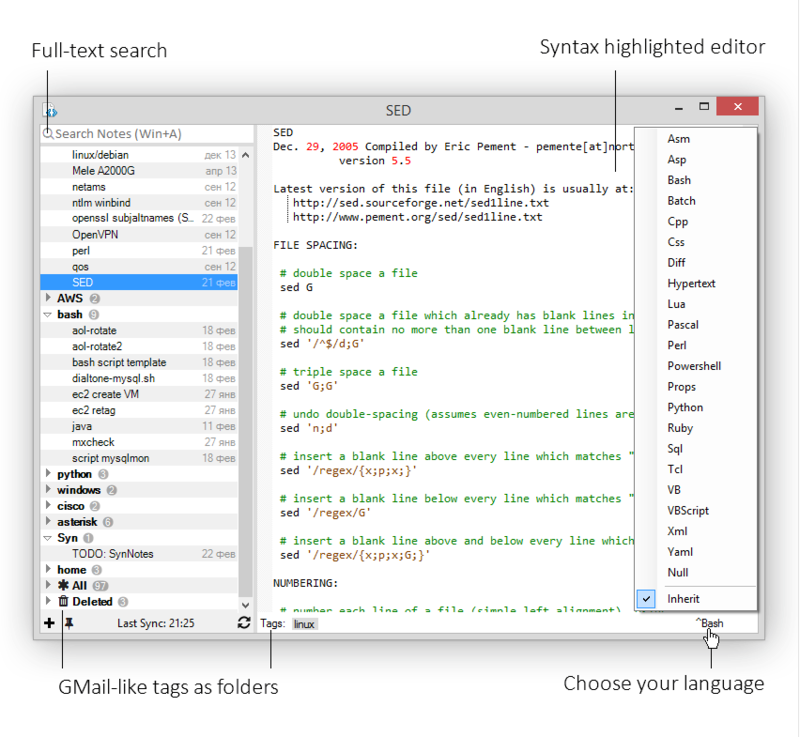 Meet SynNotes - simple syntax highlighted Notes manager with incremental full-text search and GMaill like tags as folders. Most of the time app basically hides in the system tray. Then you push global hotkey, and it appears with last Note opened and Search field already focused. After you found data needed hide the app back by pressing ESC. It's strange that zabbix-agent lacks for information about network socket states. At least it would be nice to monitor number of ESTAB, TIME_WAIT and CLOSE_WAIT connections. This script will make long lines split to 3 columns, to make text more readable for wide screens. And the most unfortunate was that putty-nd sources weren't available. Latest one I was able to find was v6.0_nd1.11 back from 2011. Now search field always stay focused, pressing Up/Down you changing selection in table. Second column shows only folder name of session in tree. To search for all sessions in some folder start searching with '/' (as in example). Searching for hostname was changed to be matched from beginning, to search for any part of hostname - prepend search with '%'. 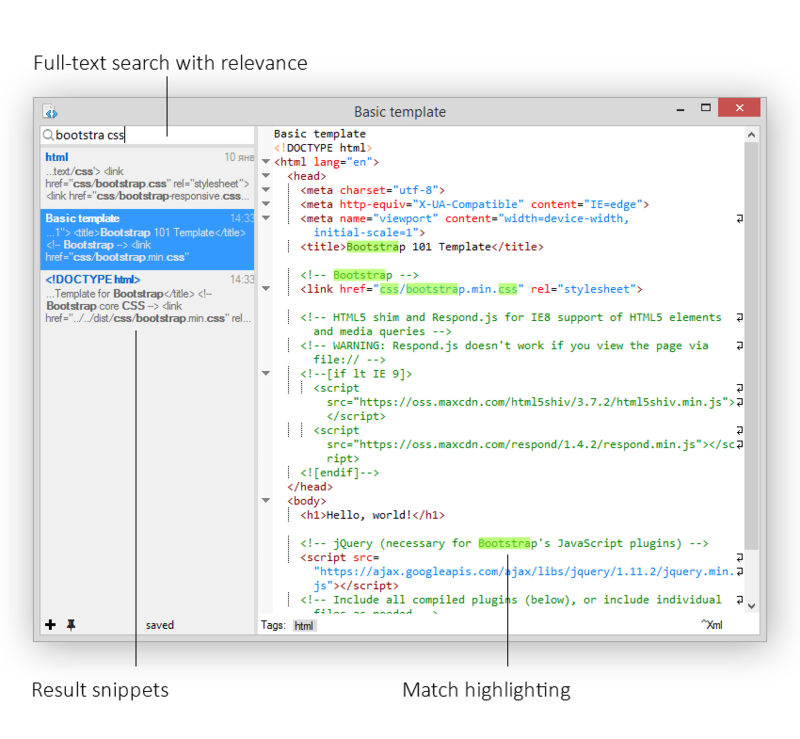 For those first two tabs context menu will be also reduced. When you switch to such tab and press Enter in console, session will try to reconnect. Main patches were submitted back to SuperPuTTY community - hope some of them would be merged upstream. (c) sepa.spb.ru. Simple theme. Powered by Blogger.